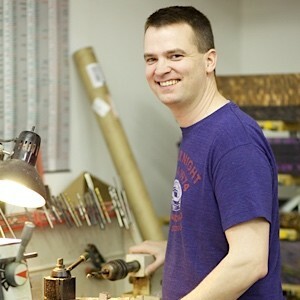 Brian Gray founded the Edison Pen Company in 2007 in his garage with a manual metal lathe. Prior to this, Brian always had a passion for fine pens and set out to learn how to make his own with no intentions of actually selling them. As a self-taught machinist, some decent looking pens began to come off the lathe. After posting his work online for people to see, it seemed that others also enjoyed these pens, and actually wanted to buy them! As sales gradually increased, Brian found himself in a position where he could say goodbye to his “real” job, and the rest, as they say, is history. Andrea co-founded the Edison Pen Company alongside Brian in the beginning. She is hands on with everything that happens in the shop in one way or another, be it pen production, shipping, receiving, repairs, nib tuning, quality control…pretty much everything! Andrea also does a good job of dividing some of her time to raise their son. Jake, being a former teacher, is actually a friend of Brian’s from college (Go Falcons!). 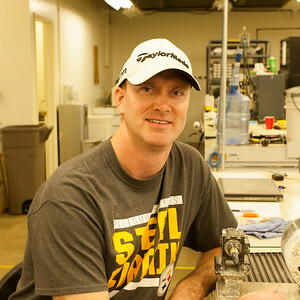 Jake joined the Edison team in 2014 after he heard that they were hiring. Jake took a quick study to all responsibilities at the Edison Pen Company early on, including administrative and office work (so you might get some polite emails from this nice guy! ), as well as pen production at all stages. 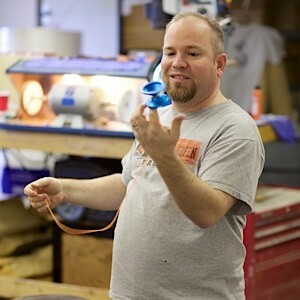 Jake is a master of the the Tuba and the Yoyo as you can see, but he’s also well versed in bad jokes and puns. Aaron Campbell joined the Edison Team part time in 2016 and became full time in 2017. Aaron caught on to this trade early while part time with Edison. After getting a feel for pens, he then decided to leave his teaching job to be a full time penmaker. Aaron is fluent with all areas of pen creation and also helps with the administration side of things. His attention to detail makes him a real asset when it comes to creating a perfect pen! Aaron enjoys spending his free time with his family and friends.